I picked up a new class this year. Actually I was cajoled into taking a ICT class in exchange for one of my Planning 10’s. “Come on Keith your will be great! Besides you love techy stuff don’t yah?” Although I couldn’t argue the point, it was still a new course and I didn’t really know what was involved. As any wily teaching veteran would do, I held off on committing to take the class until I checked out the IRP. (Integrated Resource Package) Once I had ferreted out a dusty old copy from the depths of the Tech office, I was perturbed to find that it was a 2003 version so I did what I should have done in the first place and went to the net and looked for something that had been written post Windows XP. As you have probably already guessed, the most recent version IS the 2003 version. In tech years, 2003 was a millennia ago. Essentially were still pounding out school work on stone tablets back then. Taking a quick look through I wasn’t very inspired. Now you may be wondering what qualifications do I have to be teaching ICT and my answer is… None! Sure I am a tech geek but I haven’t taken any formal training in anything. Actually that is not true. I did take 4 weeks of first year computer science before I dropped it but that was in 1990 and in tech years, we were still killing wooly mammoths with our bare hands back then. Although I felt confident to take on the class, I realized that the kids I would be getting were going to be light years ahead of me in many respects, in one area especially. Coding! Regardless of my inadequacies in this area, I still wanted to make coding a major part of the course because coding is all the rage these days and all the cool geeks are doing it. This is where Open Learning comes in. The only way I could provide kids with any sort of learning experience around coding was to utilize the wealth of Open Learning resources available on how to code. I realized from the get go that there was no way I could learn this stuff and turn around a try to teach it day in day out, so I resolved to just set them loose. For me this was unnerving. This would be the first time in 17 years where I have not been dishing out the information the kids needed to know and god help me if things went sideways. Now, three months into the year, my role has become more of a director of resources. If a kid needs help and I can’t answer the questions, I find another kid who can. I find and present to the kids learning resources and opportunities which they can utilize to enhance their own self-directed learning. At times it feels like we are moving a little fast and loose but the kids always seem to be on task, get things done and enjoy what they are doing. I have yet to have any eye rolling or groaning, I never have any absentees, they are all in class on time… It is a remarkably efficient classroom. Having said that, I am sure things will now go to hell in a hand basket. What I do find myself doing as a “teacher” is trying to get the kids to think about what it is they are doing. What are the ramifications of the app you want to develop, the image you have created or the digital footprint you have made? So many of these kids view what they are doing with or on a computer as isolated events. Rarely do they think about the social ramifications of their digital creations or actions. To combat this blinder effect, I will take a class every couple of weeks and look at the social consequences of what we create using technology. This little experiment has made me realize that I may no longer have control of the content but I do have control of the context. The traditional sage on the stage approach gives the teacher the power / responsibility to deliver content and context all at once but with open learning, context can be glossed over by the learner or is missing entirely from the content. Therefore, it is incumbent upon the teacher to frame the individual learning within the appropriate context. Your Ed Tech Brand – Teacher as an influencer. It would seem a new blogging schedule is starting to emerge. This going to school thing is forcing me to sit down with a glass of Shiraz in hand and hammer out a new blog post every Friday night. Not that I am complaining… I love Shiraz and I love Blogging, so here goes. This weeks instalment is all about online identities and how it plays out as a connected educator. Bonnie Stewart dropped in as our guest moderator for this weeks #tiegrad class and shared some of her thoughts on what I found to be a riveting topic. The discussion generated some very interesting questions about the ramifications of being a networked educator. For better or worse, teachers now have access to extraordinarily powerful tools with which to share their ideas and opinions about education. As a result, classroom teachers are changing the landscape of education in a way we have never seen before. It was a discussion that went far beyond the usual spiel of “thou shalt not post pictures of your drunken escapades in Aruba last Christmas” It was a discussion about the consequences of letting a schmuck teacher such as myself, influence others in a way that was virtually impossible just a few short years ago. This discussion was so interesting because it was about ME! I am living proof of the power of being a connected educator. Two(ish) years ago, I was just some guy who worked with at-risk kids. My influence hardly went beyond the confines of the staff room and even then my influence was negligible. The only reason my existence mattered was that I took up space around the lunch table. Then along came a my blog and a twitter account and whether it be warranted or not, all of a sudden I had influence that reached far beyond the small confines of our staff room. Although I kinda realized it before, yesterday’s class got me thinking about my responsibility as a connected educator. The questions we looked at revolved around the ramifications of being a connected teacher. What are my responsibilities and who should I answer to? We also got into how networked teachers are disrupting the traditional power structures in education and what the consequences could be? Here are the significant questions I went away with. Anyone who has been following me for any length of time, will be able to figure out my answer to each so I would LOVE for you to chime in with your own answers to these questions. If you have a second please leave a comment and share your opinions/answers. What is the teachers place in the this new interconnected world? How vocal should a teacher be on a social network? Should connected teachers be expected to parrot their their school district’s party line? Where is the line, how edgy or outspoken can a teacher be without being open to discipline? Should your online identity stray from the person you are in the classroom? Does a strong online presence threaten existing educational power structures and is that ok? As hard as it is to believe… The school year is rapidly coming to a close and this means it’s time to reflect on the year that was and give you my #EdTech year in review. As usual, I will be assuming my role as the Eeyore of EdTech and focusing on the gloomier side of things but it is all well intended. As my loyal readers know, I am not a “Rah Rah, Sis Boom Bah! !” kinda guy, so without further adue, I give you my #EdTech year in review. Gasp! I know, as implausible as it may seem, our iPads in the classroom experiment came to an unceremonious end this year. Knowing the iPads in the classroom community as I do, I already know what they are all thinking but NO!… we did not “do it wrong”. We just came to the conclusion that a one device model was not workable in our situation. IMHO… The reason the cohort failed to thrive is that we have a dynamic school with kids of all stripes and configurations and as such, we quickly learned that a single device in the hands of a specified group of students, is a very difficult thing to engineer. As much as the school system likes to categorize, rank and pigeonhole kids into groups, things just don’t work that way in a comprehensive high school like ours. Right out of the gate, we discovered that the diverse scheduling needs of our students, simply didn’t lend itself to a one group, one device model. The first year we managed to keep the cohort together because we targeted kids who’s scheduling would be (mostly) the same but this year we opened things up and we immediately found that we could not keep the cohort together but that is ok. Like I said, we are a comprehensive school, we don’t want to schedule kids into a single track and as such the cohort model just didn’t work like we had hoped. The other thing that happened along the way, is that our school quietly and unceremoniously hit the ever so elusive #EdTech tipping point (I think) and adopted a BYOD policy right under our noses. There is no longer a need to try and engineer a classroom where every kid has a device in hand, it just happened au natruel. Regardless of how things shook down, we learned a lot from this little experiment. All the teachers involved came away with a greater knowledge and understanding of how best to utilize digital tools in the classroom and will continue to apply and expand their skills for the rest of their careers. Perhaps more importantly however, is that the group of teachers who were a part of the iPads in the classroom experiment are now sharing what they learned with colleagues both near and far. The iPads in the classroom pilot WAS a success, just not in the way we were expecting. As I had mentioned in the previous section, It would seem that we may have hit the #EdTech tipping point and what better measure to determine this than bandwidth use. This year was a definite struggle with getting connected with the outside world, from within our schools. It was like we hit a wall this year and when I say “We” I mean the Royal “We”. Schools everywhere were discovering that a building full of people using the internet all at the same time, can pose a wee bit of a problem. It has become painfully obvious that infrastructure upgrades are becoming an immediate need for schools that are going digital. The problem now, is figuring out how to pay for it. With shrinking education budgets, it becomes very difficult to justify spending money on improving connectivity when you are looking at cutting back on teaching staff and educational programs. My prediction is that, we (public education) will be looking at corporate sponsored funding for these types of upgrades very soon. It is a Pandora’s box waiting to be opened but it is coming… mark my words. Note: The bandwidth issues we were experiencing in my school this past year were recently addressed and access is much improved. This year was an interesting one as the #EdTech movement, gained some significant momentum and began pushing hard for greater use of technology in classrooms. Along with this has been a growing expectation that teachers embrace the digitization of their professional development and to some extent their professional identity. The Personal Learning Network or PLN, was the topic du jour at many a staff meeting, blog post and twitter chat. Now if you recall, I am a bit of advocate for the integration of digital tools in the classroom and I am a REALLY BIG fan of the digital PLN but things are starting to get a little ugly out there. You see it at staff meetings, on twitter, in blogs and in main stream media. Those who are not on the #EdTech train are getting hammered with criticism. I even got attacked on twitter a couple of months back for questioning a “EdTech GuRu”. It was really quite astonishing how quickly this individual and her disciples piled on in an attempt to marginalize my critique. My questions weren’t even addressed as they immediately labelled me as a #EdTech heretic and proceeded to try to discredit me through the medium of twitter. I have to plead guilty of being an #EdTech bully myself. During a staff meeting, I disrespectfully responding to a colleague when he questioned the usefulness of social media as a professional development tool. Although I eventually tried to answer his question respectfully, I started off with a dismissive smart assed comment, which had no place in the discussion. I never thought the #EdTech discussion between the Pro and Whoa camps, would ever degrade to a showdown but I am afraid we are heading down a path toward greater conflict. Lines are being drawn and they seem to be more ideological rather than pedagogical. All in all it has been a good year. I certainly haven’t been as active in the #EdTech community as I was last year but I just couldn’t keep up the previous years pace. Next doesn’t look good either as I hope to begin my Masters in Education Technology (if I am accepted) and will probably have even less time to share my insight and opinion. One positive however, is that when I do show up, I might actually know what I am talking about since I will be all lerned up reel good. Have a great summer all… Cheers! Well, as usual… I am light years behind the curve. I always seem to be a little slow to arrive at the party and when i finally do, all the cool people have already left but I never no mind, it’s all good. Better late then never my dear old pappy use to say. My most recent late arrival, was a book called The Tipping Point by Malcom Gladwell. I found it sitting on the old and irrelevant table at Indigo while doing some Christmas shopping. Normally, I would have never even noticed the unassuming title but since I spent most of 2012 listening to educators yammer on about the “Ed Tech Tipping Point…” When I saw a book with “Tipping Point” in the title, it caught my eye. Now that I have finally arrived at the party, long over though it may be, I can finally put my two bits worth into the Ed Tech Tipping Point discussion. First of all, I have to say, I enjoyed the book. Gladwell brings up some very interesting points about social epidemics and I certainly understand why some educators are looking for just such an epidemic to occur with Education Technology. However, after hours of careful consideration, my conclusion is that there wont be a Gladwellian Tipping Point in Ed Tech. Instead, advances in Educational Technology will to continue to be (as it has always been) more of a slow submersion into the digital domain. A dipping point as it were. Coincidentally, not a week after having come to this conclusion, I stumbled upon a Blogpost from Mind Share Learning, talking about the Ed Tech Tipping Point in their Top Ten EdTech Predictions for 2013. They seem to think that 2013 WILL be the year the Ed Tech tipping point occurs but I am holding my ground…. There will be no tipping point in 2013 or any other year and here is why. I will try best I can, to relate Education Technology to Gladwell’s book. If you haven’t read the book, give the original article (on which the book is based) a quick read The Tipping Point – June 3, 1996 (New Yorker Magazine). From a purely hardware perspective, the tipping point has already happened. If you don’t believe me, just look in your nearest high school classroom. There is a digital device in the hand of 90% of the kids and based on the degree of digital distraction going on at staff meetings, one in the hand of 90% of the staff as well. If I ask kids if they have a digital device to use for any given lesson, the majority of the class reaches in their bag or pocket and pull out more computing power then put a man on the moon. Now I realize that this situation is not the same for every school community but at my school, we long since tipped and are swimming in the digital deep end. The hardware is here and in the hands of many if not most but still we have not seen an Ed Tech tipping point. Just as Gladwell tells us in his book, in order for an epidemic to occur we need “it” to stick and technology stuck to education long ago. The jump from scroll to bound books is an example of technological change. A little more recently, I remember how people thought VHS was going to revolutionize education; then desktop computers came along and were suppose to change everything; then the internet came along and distributed leaning systems were born, which promised to change the way we learn. Now mobile devices are being held on high and trumpeted by proponents as the most revolutionary thing education has ever seen… Adoption of new technology has always been a part of education but there is still no tipping point as Gladwell describes it. In my mind this can only mean one thing, although technology itself is sticky, hardware is not. We find ourselves chasing the hardware, not unlike a heroin addict chases the dragon. The last hit is never enough and this is one of the reasons we have not seen an Ed Tech tipping point. When we focus on hardware acquisition, what we end up doing is moving the tipping point further and further away. If this continues, a Gladwellian tipping point will never occur. This is the idea that there is a small group of people who start, champion and spread a social epidemic to the masses. Gladwell refers to these people as Mavens, Connectors and Salespeople. Any one of these types of people can act as a tipping point but these types of people frequently act in more than just one of these roles. For example, many well-connected people are also good sales people, like Chris Kennedy (my superintendent). He has taken on the role of consummate Ed Tech ambassador. Myself, I am more of a grunt or as Gladwell calls it, “a Maven”. I don’t do a very good job of connecting with others or selling the idea of Ed Tech but if anyone asks for information or help with Ed Tech, I am your man. Believe it or not, Gladwell’s law of the few is alive and well in education. These types of people are littered about the education profession and they have done a very good job selling the idea of Education Technology to their colleagues. New converts are joining the Ed Tech epidemic daily but just like the social epidemics Gladwell uses in the Tipping Point, it doesn’t infect everyone. Not everyone in Gladwell’s social epidemics bought Hush Puppies, got syphilis or committed suicide and just like a Gladwellian epidemic, not everyone in the teaching profession has bought into the epidemic of Education Technology. Championing, Connecting and convincing others to join or become a part of a social epidemic is a difficult task and there is no reason to expect that everyone in the teaching profession will buy into the Ed Tech Revolution. Does this mean these are bad teachers? No… By Gladwell’s measure, it simply means they didn’t need, connect or were sold on the value of Education Technology. The third element of a Gladwellian epidemic is context, or the place where the would-be epidemic lives. This element can involve social, geographic, economic and other factors both big and small. It is here, I believe, that the most significant Ed Tech’s tipping point is hiding. The two most significant being, access too and pedagogical value of, Educational Technology. Access to Educational Technology comes in many forms. As I described in the stickiness section, the school I work in is not starved for hardware. It is readily available but we still struggle with access to what we need to run a technology rich classroom environment. We have become victims of our own success and as such, we have significant difficulties assessing resources on the web because we frequently exceed the bandwidth capabilities of our network. (insert eye roll here and say… “Rich people problems!”) As ridiculous as it sounds however, if our digital tools don’t work, there isn’t much point in using them and teachers tend not to use things that don’t work. If we want teachers to use all the latest gadgets, we need to give them access to not just the gadgets but the information sources they are built to use. I have done workshops where staff want to use iPads in the classroom but they have no wifi. This immediately relegates the iPad to nothing more than a high-tech paper weight. There are other school districts in this world that can’t afford to maintain their existing hardwired networks, never mind creating a learning environment that delivers ubiquitous access to all staff and students. Without dependable and equitable access to the digital landscape for all stakeholders, we will not be seeing an Ed Tech Tipping point anytime soon, never mind in 2013. As for the value of Educational Technology, It has to be said… The jury is still out. Proponents see wonderful things just waiting to be unleashed on our children’s learning spaces, yet the stalwart traditionalists have yet to be sold on its value. Kids who function well in the absence digital tools or perhaps I should say are not dependant on digital tools, still seem to out perform those who are immersed in the digital world. My own children are a case in point, they excel because they have strong reading, writing and numeracy skills, learned the old-fashioned way. In my household, digital skills are an adjunct to these old school skills not the means by which these skills are acquired. The fear amongst many however, is that we are trying to replace the tried and true with the flashy and new. In doing so we are moving in a direction that puts engagement before good old-school foundational skills. A colleague said to me the other day. It is this kind of thinking on which Educational Technology has become hung up. Does technology really improve learning outcomes and who are we sacrificing in the process? Some feel the solution is to simply “unload the dinosaurs” then you will be rid of this kind of fear mongering but it has been my experience that this question resonates within the teaching profession, from newbie to retiree. It is here that I believe the most significant Ed Tech tipping point lies. Prove to the world that technology improves learning outcomes for everyone. Make people understand that Ed Tech is not a replacement but an addition to a child’s foundational skills. Show people that old-school and new-school can coexist, that a learner who uses technology to amplify their foundational skills, will out perform those who don’t. If we do this, you might have a Gladwellian epidemic on our hands. As I said early on in this post, in some respects, the Education Technology Tipping point has already happened. Thousands of teachers have bought in and are using technology in their classroom on a daily basis but people like me, seem to look at EdTech integration as an all or nothing proposition. It is almost like we are in a bad episode of Star Trek – The next Generation and the Ed Techies have taken on the roll of the Borg and Old-School Teachers must be assimilated into the continuum but this is not how Gladwell’s epidemics work. Not everyone is a part of a social epidemic. Technology has its place in education and it is becoming more significant as the years go by but an en masse adoption of technology in the classroom will not happen because epidemics don’t infect everyone, nor should they. As with any population that is exposed to an infectious agent, you don’t want everyone to get the plague. You need a portion of the population to survive and carry on. I am glad there are people in our education system that stop and say “What the hell are we doing?” “Is this right?” and “Is this what is best for everyone?” Our education system doesn’t need lemmings, it needs thoughtful practitioners who challenge social or technological epidemics. My final word… There will be no Ed Tech Tipping Point in 2013. Wow! Another year has come and gone and I am still employed. Not that I shouldn’t be, just that this blogging thing puts you under a bit of a microscope. One wrong word and BAM! You are collecting unemployment and rummaging through people’s road side recycling, while the kids are at school and the wife is at work. This year has certainly been eventful and rewarding but I am definitely not on the same track I was last year at this time. Last year’s Christmas reflection was all about the student, the device and the classroom. This year, my iPad cohort went to hell in a handbasket and thus my attentions are not quite so focused on iPads In The Classroom so much as they are Technology and the Classroom Teacher. This was the Acronym of the year and perhaps the single most important part of my professional development over the past year. 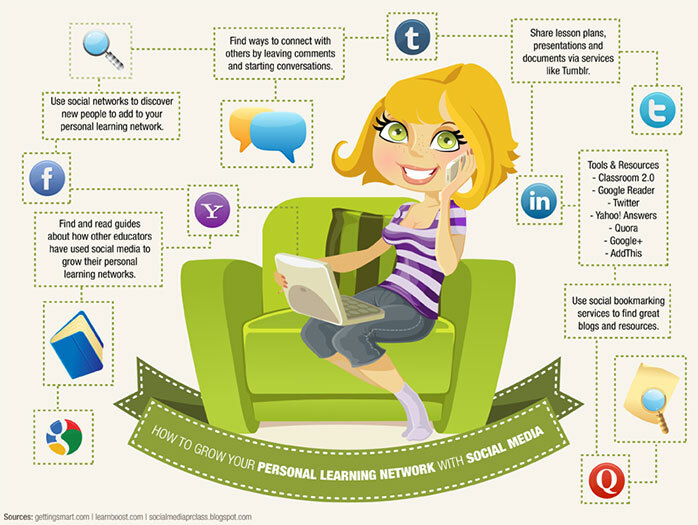 The Personal Learning Network has gone digital and in doing so, has revolutionized how we communicate as professionals. I have gone with a three-legged stool approach and have built my PLN on the following. These three items have come together and have profoundly changed the way I do my job but more importantly, how I see my self as a teacher. The Digital PLN is a POWERFUL tool and I highly recommend it to any and all teachers. It has become crystal clear, that if we expect teachers to make digital technology a more significant part of their teaching practice, they need more Professional Development. When I say “More ProD…” I don’t mean a series of rinky dink hour-long workshops on “using twitter in the classroom” or “The latest apps for teaching…” I mean purposeful hands-on experience with technology both in and out of the classroom. In order to get an idea of just how much time the “experts” with educational technology have put in, I will use myself as a “Average Joe Blow Educational Tech Geek” example. The very first day of my practicum in 1993, I was introduced to a program that made word searches and crosswords that you could print out for use in the classroom. Since that day, I have logged innumerable hours using technology to make my life in the classroom easier and hopefully my teaching practise better. To get an idea of just how much time I have spent, assume that since that day in 1993, I averaged a single hour a day using technology for the purpose of improving my teaching practice. Multiply an hour a day by approximately 180 school days for 19 years and you get 3429 hrs of hands on time with educational technology. I am quite certain however, that number should be doubled if not quadrupled. In the past 12 years, I have easily met and far surpassed Malcome Gladwells magic 10,000 hour mark to becoming an “expert” in anything. What is most important to keep in mind here, is that these 10,000+ hrs have been purposeful. It wasn’t just time sending emails, surfing the net, watching silly kitty videos or squandering time on some social network. What is also important to note here is that, until this year, the hardware used and the time spent has been almost entirely on my nickel. This time has been a HUGE investment for me and I did it because I love the stuff but other people have other areas of pedagogical interest; therefore, we can’t expect that everyone is willing to put in the hours on their own dime, like I have. Finally, if we look at proficiency with Ed Tech from a “purposeful time spent” perspective, it goes a long way in explaining why “digital literacy” is not all that common in the classroom. It also helps to dispel the digital native myth and explain why new teachers are not coming hard out of the gates, with the digital skills necessary for the 21 Century Classroom. Technology in the classroom will always remain on the fringes if teachers are not provided the opportunity to play, practice and implement the technology they are being asked to use. There are two sides in this Educational Technology debate and I have tried to situate myself squarely in the middle of them, not because I am afraid to take sides but because I firmly believe both sides have value and can coexist. There are those however, who are hunkered down in their respective battlements and are preparing for the looming battle that lies ahead but like any war, little good will come of it. This past week our director of Educational Technology in West Vancouver said to me, something along the lines of… “With my own kids, I just wish “we” (as in education system) would just decide to which world we are going to educate in” He then suggest that I read a book by Steve Johnson – “Future Perfect”. I have yet to crack the binding but my understanding is that the premise is that technology is changing the way we think and that going digital is just part of our evolution. Although I can appreciate the premise, I cannot buy into it. As a classroom teacher and a parent, I watch the kids who straddle the two worlds (hardcopy and digital) and they are excelling. The ones who are all digital and in the rare case, all hardcopy, seem to me to be struggling. At this point in the game, I don’t think all in or all out is wise. Kids need to be able to think and function in both, in order to be successful. At the beginning of this year, I was much more Pro BYOD then I am now but I will go out on a limb and say it here and now. For instructional purposes, having a set of single platform devices in the classroom is far superior to having a rag-tag, hodgepodge, mix-in-match, dogs breakfast set of devices in the classroom. I know that there are a number of people out there saying how wonderful BYOD is BUT! It is not a plug and play scenario. A single OS classroom makes things simple because it is easy to have everyone seeing and doing the same things on the same application at the same time. Yes we need to personalize education but there are times when uniformity kicks the stuffing out of diversity and instructional time is just one of those times. Classes with highly digitally literate students. When the applications you use are available across all platforms. When you just feel like pulling your hair out in frustration. For the past 2+ years, the iPad has been seen as the only single OS option worth considering because of its portability, functionality and moderate price but now with the new $250 Chromebook on the market, that should change. I am really quite excited about the Chromebook and think it will go a long way in making the single OS classroom, an easier task. This is a biggie. Access to digital tools and digital networks is simply a must have, in order for Educational Technology to be effective. Get the a device in the hands of the learner piece, is a no brainer. No device, then no digital assisted learning. Although 1:1 seems to be the “ideal” scenario, lately I have been hearing noise that 2:1 is actually better. It creates a situation where kids have to work together because they actually have to talk to each other, share the device, their ideas and even plan how they can best accomplish the task at hand. In a 1:1 situation, you have kids so immersed in their device, nary a word is spoken. The second piece is Access to a network that will give you access to the Web, without which, much is for not. Late last summer, I was doing an iPad workshop at a school that didn’t have any wifi and from what the staff said, there didn’t seem to be any plans to have it installed. It was certainly a challenge, running a show and do workshop with no wifi but it wasn’t near as difficult as it was going to be for them, trying to implement iPads in the classroom with no wifi. Wifi access is even an issue in a wired school district like West Vancouver. We have become victims of our own digital success. We are stretching our wifi capacity to its limits and using your digital device is frequently more of an exercise in frustration, then it is a learning experience. I have even had to used my phone as a wifi hot spot, just to get through a lesson. Not only is this an annoyance, it is costing me $$$ in data use. The thing that makes the digital device so powerful as a learning too, is its ability to access and share information. Without network access, both you and your students are handcuffed. I will wrap up with a couple one liners I heard over the year that resonated with me and are worth sharing, as I think they are very important as we move ahead in the world of Technology in Education. All but one I agree with. “Teachers who are using technology effectively in their classrooms, need to share” – ??? And so wraps up another year of iPads In The Classroom. Stay Tuned for an exciting project my good friend and colleague @Scapier are working. We will release it in the new yearand hope to turn the teaching world on its ear!